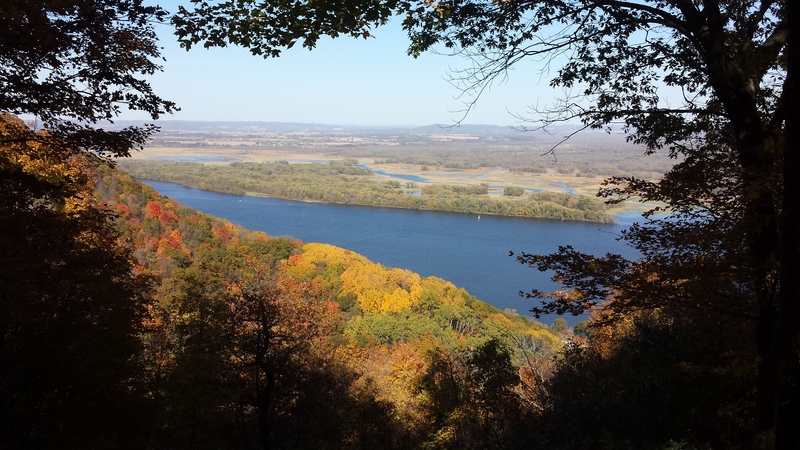 Fall is one of the best times to go hiking in the Upper Midwest. Green hills erupt into flames of red and yellow and orange. The air is crisp enough to invigorate after a summer of languor, but not yet frigid enough to force a retreat beneath the covers. Whether along the ridges of the North Shore or the meandering valleys of the Driftless Area, the countryside beckons. In need of escapes after a long week, we run off into the woods and go barreling up and down bluffs and hills with reckless abandon. The metaphor here is none too subtle. We’re running up these hills in search of something. It’s a constant hunger, an ambition to push to the top, wherever we may be. It’s an old trope, though its sincerity takes some edge off the cliché. We can only linger at the top for a moment, but the real power comes in the push to the summit, the pursuit of goals at a breathless pace. And the view, even if it lasts only an instant, remains etched in the mind’s eye, that lone memory of this season that will endure. This fall brings on new levels of relentlessness. And yet those moments still come: those moments when we get closer and realize that the narratives we write aren’t about progress from one thing to the next but instead a ceaseless cycle that brings things in and out, forward and back, the past and the future blurred in some formless thing we call ourselves. This land we walk upon was here long before us, and will be long after. We only have a fleeting window to leave a mark. And so we push up the peak even faster. Now is the time to remember that it’s all in the service of something, all part of some greater mission, and that the exertion is worth every ounce. Beneath an Indian summer sun and a ceiling of golden boughs, it’s not hard to imagine an order behind it all; some higher power at work. But the true believers run the risk of assuming they have it all figured out; that one view from the summit reveals all. Perhaps the simple beauty of the moment is enough, and we can instead work to preserve it, to make sure that all can enjoy these little glimmers. But a rootless commitment to the good cannot endure; it must be able to perpetuate itself, and to feed the fire anew. To what end? The answer is buried amid fallen leaves, none too easy to decipher. A glimpse here or there will have to do. The sun sinks toward the horizon, but we still have time to climb one more hill, do we not? Who knows what the next one will reveal. It may not be anything too different. But the push conditions us, and we know that, no matter where the path may twist, we’ll have the energy to finish the journey. Even in autumn, youth: the will to never cease this desire to form a little world where we can reach the apogee of human achievement, in whatever form that may take. Ever upward. It’s not often one can glance up at the TV in a bar and see a kid he used to bump into in the hallway skating across the ice, but it happened to me this past weekend. Former Duluth East defenseman Derek Forbort made his NHL debut on Friday night, as he registered one shot in 11 minutes of ice time for the Los Angeles Kings in their overtime win over the Wild. Forbort is the sixth ex-Hound to appear in the big show, though he may soon have company in the form of a couple of UMD Bulldogs. It wasn’t the smoothest road to the show for Forbort—most of the other players drafted around him in the 2010 draft made their debuts years ago—but make it he has, and it was just one of a few highlights this past weekend for those of us with our roots in the North. The NHL have been under way for a couple of weeks now, but the first major college series of the year, an early season home-and-home between Minnesota and Minnesota-Duluth, ushered in the hockey season more properly. The two-game series revealed two teams in decidedly different places, and while the end result wasn’t an overwhelming surprise, the gulf between the two squads was the lingering takeaway. Minnesota Duluth’s 3-1 and 3-0 wins gave them six in a row over Minnesota dating back to last season, their greatest run of dominance over their southern rivals in school history. The Bulldogs return a veteran core from a team that narrowly missed the Frozen Four a year ago, and after slipping up in their opener at Bemidji State, they looked the part against the Gophers. Two three-goal nights may not seem overwhelming, but their relentless pressure in the offensive zone had them in control for most of the series. It was offense-as-defense at its finest, with gaudy shot counts over the first four periods. Dom Toninato, ever a powerful presence, scored twice on the weekend; freshman Adam Johnson seamlessly slid into the Bulldog top line with Toninato and Alex Iafallo. All four lines were humming along, and the Bulldogs simply owned the neutral zone. The Friday night performance was even more impressive considering the absence of the suspended Carson Soucy, whose tracer in the Saturday game—with some help from a Karson Kuhlman tip—gave the Bulldogs their second goal. The giant, physical defenseman is an imposing force, and he and Andy Welinski make for a dominating one-two blueline punch. One of the Bulldogs’ most apparent weaknesses this season is a lack of defensive depth, but after some rocky moments early in the first game, the greener UMD defensemen all settled in and had solid series. The difference in comfort of the new arrivals was one of the distinct differences between the Bulldogs and Gophers all weekend long. 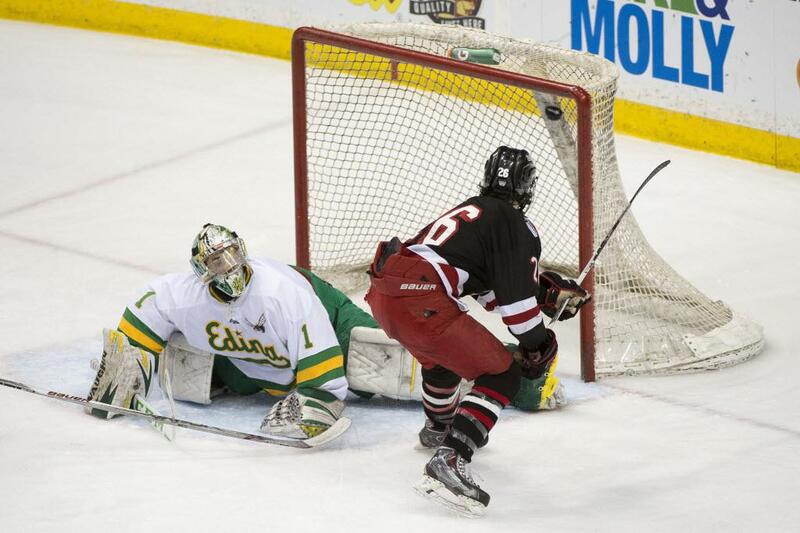 It’s Frozen Four or bust in Duluth this year. For their part, the Gophers came out with good energy in the opening ten minutes of both games, pushing the pace and forcing some quality saves out of Kasimir Kaskisuo. Other than that, they only showed life once down 3-0 in the second game. Their two returning stars, Hudson Fasching and Justin Kloos, disappeared for stretches of the first game, at times trying to do too much on their own. Taylor Cammarata, the poster child for the Gophers’ lack of fight a year ago, looked more willing to go into corners, but is ill-equipped to do much once there. Brent Gates Jr. got the lone goal of the weekend, while Tommy Novak was probably the most consistently useful of the freshmen. This isn’t wildly unexpected. These Gophers are young, and looking to recover from a veteran-laden season that went all wrong. Even so, teams lose as much as they do year to year and get by just fine. They’ve scored just once in three games, and the whole clearly does not match the sum of the parts. There is too much talent here to languish in a cellar. The effort of some of the forwards gets the most flak, but I’ll point to a number of sophomore and junior defensemen who have yet to live up to the hype: they are far too soft in their own zone, and the fluid puck movement that should be the Gophers’ staple has degenerated into blind outlet passes. Add in a coaching staff that doesn’t seem willing to adapt a system to the team they have, and there is a recipe for ugliness. Yes, it’s still early. But they need to turn things around before Big Ten play starts, or the whispers about Don Lucia will grow louder. On the high school side of things, there’s less than a month until practice opens, and the Elite League is deep into its second half. So far, the league has been owned by Team North, a squad that has just three schools—Grand Rapids, Hermantown, and Duluth East—accounting for the vast majority of its players. With Bemidji looking strong as well, this could be a banner year for the North. East’s Luke Dow and Ash Altmann are flashing their offensive talent and are the top two forwards, though the team’s leading scorer is the sublimely silky Scott Perunovich, a Hibbing defenseman and future Bulldog. He and Hermantown’s Wyatt Aamodt make for a defensive pair no other Elite League team can match. Future Gopher Casey Mittelstadt is the Metro area’s finest player, though he relinquished the league scoring lead to Breck’s Chase Ellingson while off playing for the national team this past weekend. Team Northeast is Stillwater-heavy, but their two big guns are Luke Notermann of Blaine and Will Garin of Holy Family. Team Southwest, home to the Edina and Prior Lake contingents, has lined the cellar so far, and the Great Plains group shows flashes. Mittelstadt joins the returning Lakeville North crew along with some Hill-Murray boys in leading team Southeast; they’re locked in a battle for second in the standings with Northwest, whose scoring beyond Ellingson is probably the league’s most balanced. They also boast its top goalie to date, Alex Schilling of Wayzata. The last few weeks of the Elite League will provide a few more clues as I go about readying the preseason AA rankings. I’ve started to comb over team lists in my spare time, and I’ve put a few rough orders on to paper. They’ll be out in less than a month. Yes, Minnesota, hockey season is finally here. Fall is kicking in to gear in Minnesota, which means that it will soon be time for those of us who are not ambitious winter bicyclists to stash our steeds away for a few months. For reasons that now elude me, I was never a big biker as a kid; the bike helmet strapped to my bag is a new addition, and given the choice, I’d rather just walk everywhere. But my graduate program contractually obligates me to begin something akin to a Tour de France training regimen, and so I have begun my education. As Adam Gopnik writes in a recent urban planning omnibus New Yorker piece (alas, it’s behind the paywall), cycling rose to prominence in the 1890s not because it was cheap or necessarily fun, but because it was the fastest way to get around at the time. This became true for me this summer, as construction fouled up traffic between Uptown and Downtown Minneapolis. I took a certain glee in whizzing past the people trapped in their cars along Hennepin Avenue every morning, and Minneapolis’s generally excellent bike infrastructure made the decision to abandon the bus an easy one. When safe lanes are in place, the cyclists will follow. As the summer went along, though, I began to take a few trips beyond the route of my daily commute. My Tours de Minneapolis never did quite enough to make my runner’s knees totally happy on a bike, but there’s something deeply satisfying in coasting through Theodore Wirth Park or pushing the pace past laboring cyclists on the few inclines this city has to offer. I would around the lakes, cruised along the river, and even made my way over to St. Paul from time to time. A bike camping trip out to the crimson trees of Maple Grove this past weekend seemed the ideal way to cap my first summer as a regular biker. It’s a pleasurable way to cruise about a city, with every corner suddenly at one’s disposal; nimble and versatile, both leisurely and a decent workout, depending on one’s desires. Defenders of the bicycle are locked in a long-running, low grade war against their great antagonist, the automobile, and no self-conscious cyclist can pedal away from the debate. A lot of drivers are supremely ignorant of cyclists, and I’ve witnessed more than a few cyclists returning the favor by weaving recklessly in and among cars. If this is how rule-conscious, respectful Minnesotans handle things, I can’t imagine the battles elsewhere. As a runner, I’ve also endured countless cyclists who either give no indication of their presence or like to think they own the entirety of a shared path. Such is the grey zone of cycling etiquette, and the frequent imbalance between the letter of the law and what proves good practice on city streets. In the end, people remain people, often inclined to vent their disgust at other anonymous individuals hurrying off to wherever it is they need to go; sometimes they simply have larger machines with which to express their pathologies. My code on the roads ignores rigid rules and settles for basic common sense. Cyclists need not come to a halt at every stop sign and red stoplight if there is no traffic in sight; a simple yield will do. For pedestrians’ sake, bicyclists should stick to streets when possible, but it is no sin to escape to the sidewalk on particularly dangerous streets. Signaling turns is the polite, and safe, thing to do. Please, cyclists, announce your presence (without sounding passive-aggressive, as if your presence should be self-evident) when approaching pedestrians who appear oblivious or might risk wandering into one’s path. And drivers, open your eyes: you do not have a monopoly on the use of our streets, and never will. As long as I’m on the topic, I’d be remiss not to add a few stray words on Duluth’s bike controversy this summer. Even though I think the Michigan Street compromise was the most practical option—and for the skeptics of it, I always took Michigan Street both ways on the handful of occasions that I bicycle commuted from my childhood home out east to jobs on the west side of Downtown—I couldn’t help be a bit sad to see the Superior Street push fail. I understand the practical limitations, but it otherwise seems like Duluth is going all in on the bicycle mecca development plan, and the lack of any accommodation for them on the city’s signature street is a glaring miss. (Suggestion for making the Michigan Street corridor work: get a ramp from Lake Place down to the street. Lugging a bike up and down those stairs isn’t ideal.) As long as the network continues to grow and people can learn what a cheap, fast, and valuable form of transport bikes can be, the end result will be a happy one. Baseball’s Wild Card Format Is an Affront to Humanity. But, what’s that you say? Hockey season starts tomorrow? In that case, all is well in the world.